Our time in Chile showed us the diversity of the country, from the bustling capital of Santiago to the hills of Valparaiso. We hiked the Valley of the Moon and Valley of the Dead. We also witnessed the wildlife close up in the Salar de Atacama. Traveling in Chile while in my second trimester of pregnancy had presented some not so unexpected difficulties. Today’s excursion would be the biggest challenge yet. 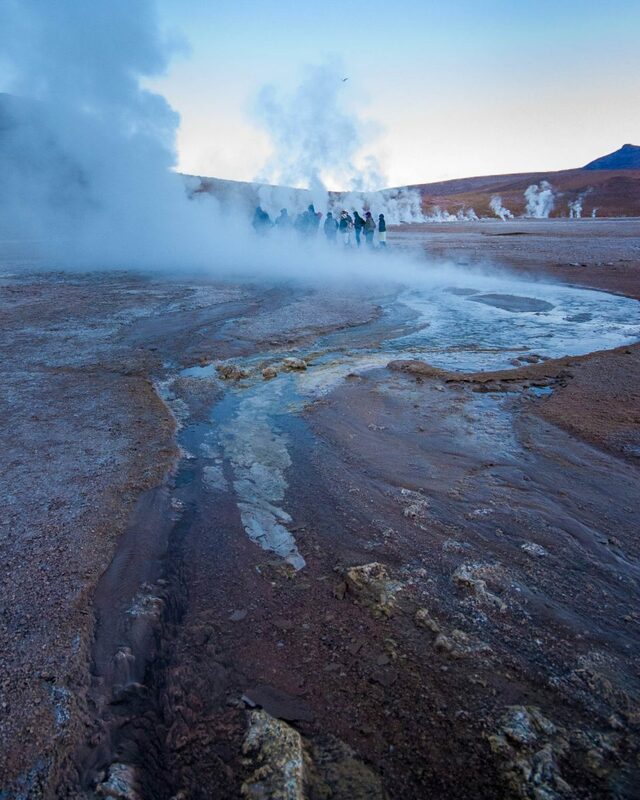 On our agenda was a visit to the geothermal field known as El Tatio Geyser. Pro-Tip: the El Tatio Geyser Field has absolutely no safety precautions in place. If you are exploring with children make sure that you keep them close at hand in order to ensure that they don’t come into contact with the scalding hot water from the geysers. 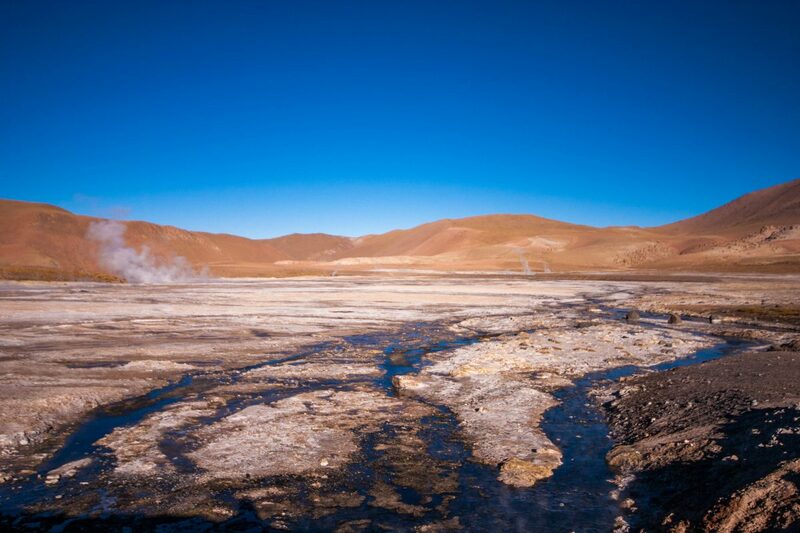 What is the El Tatio Geyser Field? 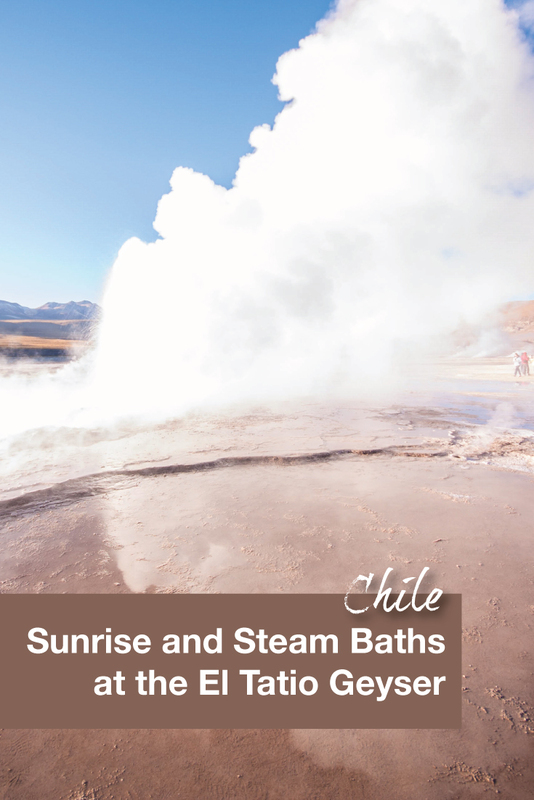 High in the Andes Mountains of northern Chile is the El Tatio geyser field. At 4,320 m above sea level, it is second highest geyser field in the world. It has over 500 geothermals with 80 of those being active geysers. It is the largest geyser field in the southern hemisphere and the third largest in the world. The geysers erupt to an average height of about 75 cm, with the highest eruption observed being around 6 m.
Although we had a rental truck, we chose to join a day tour for our visit. Many companies offer day tour services in San Pedro town and although we pre-booked the excursion while still in North America, we could have just as easily waited until we got into town to book. The entrance fee to the geyser field is not included. We paid separately when we got there. We were staying right in the town of San Pedro and were picked up promptly in the front of our hotel at the brutal hour of four in the morning! There were two other couples on the tour. All six of us loaded into a van for the ride into the mountains. 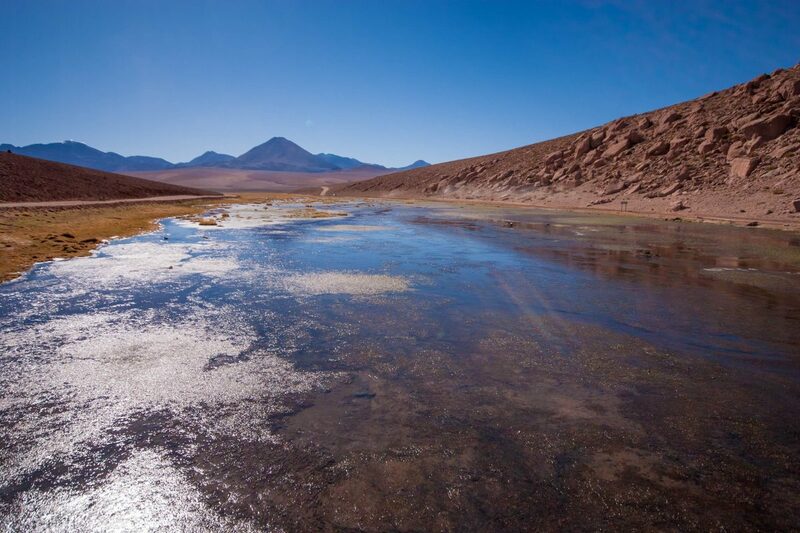 Pro-Tip: Due to the high altitude of the El Tatio Geyser Field, it’s recommended that a day or two be spent at the lower altitudes in the Atacama in order to acclimate and avoid altitude sickness. The El Tatio geyser field is about a 95 km drive through desert plains and mountain switchbacks from San Pedro de Atacama. With the early start, it was still dark. The drive was supposed to last between 2-2.5 hours so I tried to rest my head on the inside of the van to get some more sleep. I’m normally a nap champion, but between a kicking baby and the bumpy roads, it was hopeless. Instead, I sat back and watched out the window as we climbed higher and higher until we were over 4000 m and on our way to the volcanic plateau. 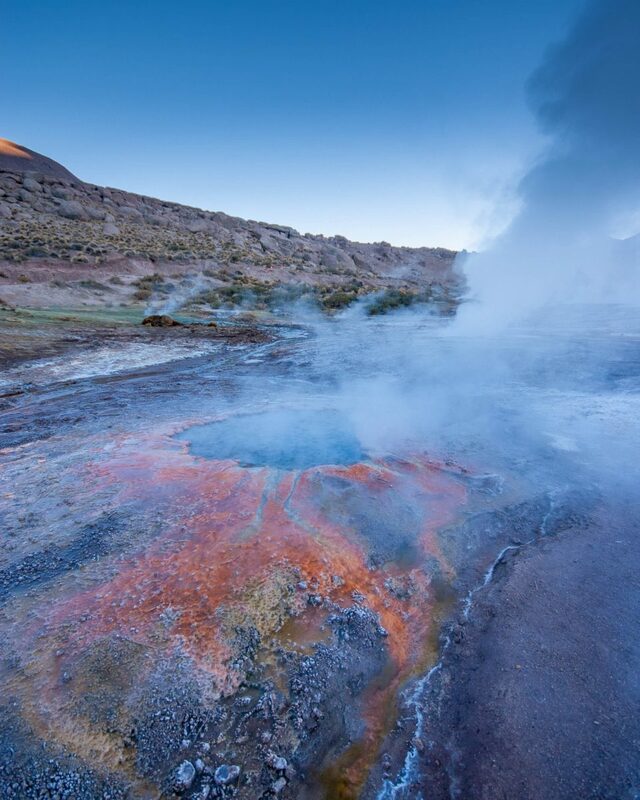 Pro-Tip: It is possible to visit El Tatio geyser on your own without joining a tour group. You will need to make sure you have a proper high clearance vehicle, preferably with 4-wheel drive. Although there are signs from San Pedro to El Tatio, you should try and leave at the same time as the tour groups so you can easily follow them while they go up the mountains. However, the tour vans find this annoying. As soon as we stepped off the van, it was clear from the number of people that the site was a major tourist attraction. You do not see the geysers right away, but you don’t need to walk far from the parking lot to see them. There are no boardwalks to mark safe walking paths, but there are well-worn trails to follow. The crust of the geyser field can be thin in some spots and visitors have been known to fall into boiling hot water. We explored carefully, making sure we were kept to the trail. The thin air was bitingly cold when we arrived, and I was so glad to have dressed in layers. 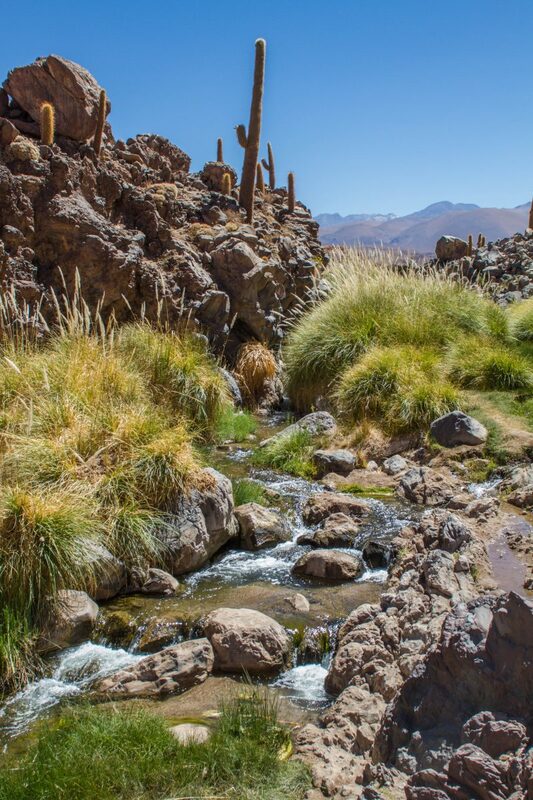 Although temperatures in the Atacama in the afternoon can reach 30°C, at 6 am and 4,000 m above sea level, the temperatures in the Andes were near 0°C. The early start to the tours is to ensure that visitors arrive at the field by sunrise. As soon as we arrived we completely understood why. Early in the morning, each geyser becomes surrounded by a column of steam that condenses in the cold air. Combined with the soft light from the sun, it makes for amazing scenery. The steam from the vents danced with the slowly appearing rays of sunlight. We were mesmerized. Although there were a lot of people at the geyser field it didn’t feel as crowded as different groups follow different trails. Although all groups do stop at the largest geyser, The Great Geysir. The steam plumes disappear as the air warms up, so getting to the field later in the day won’t offer as dramatic an experience. After getting our fill of the geothermal field our tour leader led us to the final stop in our tour of the field, a large natural hot spring. Yes! It is possible to bathe in the hot geyser water in a small pool. By the time, we got to the spring many people were already enjoying the warm waters. Pro-Tip: If you are traveling while pregnant consult with your doctor beforehand to make sure the activities you are partaking in will be safe for you and your baby. After a couple of long days hiking, I certainly wanted to jump in and soothe my aching muscles. However, before we left for our vacation, I had consulted my doctor and although he gave me permission to visit the geysers, he strongly advised against going into the hot spring. I enjoyed watching Kevin plunge into the inviting 35°C water to combat the 0°C temperature outside. I did manage to dip my aching feet into the pool for a few minutes and it was heavenly! To pass the time, I munched on some delicious breakfast prepared by our tour guide while the others splashed in the hot spring. Most tours come with breakfast and drinks as part of the tour package. After an hour of relaxation combined with some much-needed food, it was time to say goodbye to the El Tatio Geyser field. Before heading back to San Pedro, there were a few other stops on the tour. 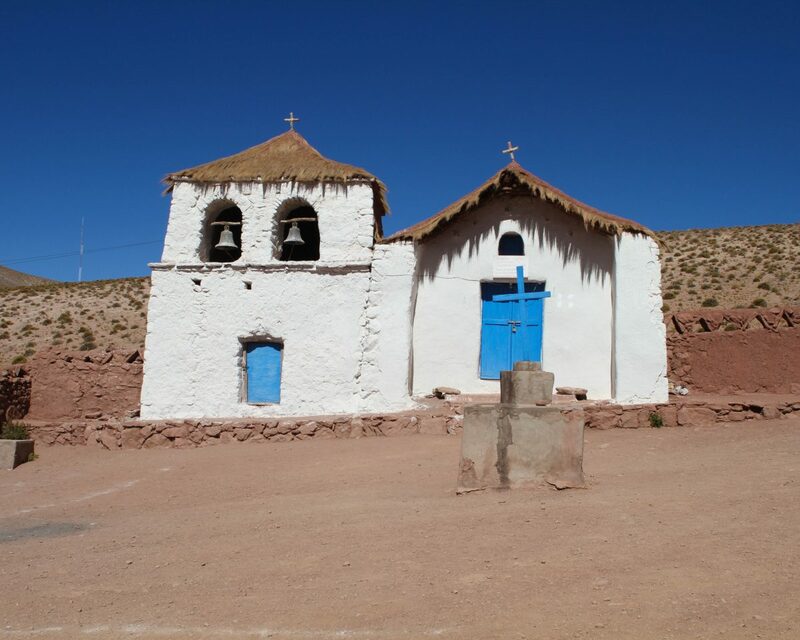 We experienced the local culture and enjoyed more of the fantastic scenery around the Atacama. Our next stop would be the town of Machuca. But before we got there, we stopped at the beautiful Rio La Putana. The shallow river offered incredible reflections of the sky. Coupled with the dramatic mountain backdrop, it made for a wonderful view. The town of Machuca is home to one family of llama herders. The whole village has about 20 houses built in the traditional method using mud, straw, cactus, and wood. There is also a small church, San Santiago Church, which is the patron saint of the village. The village thrives from the daily visits from tourists. The locals sell traditional Andean handicraft from stalls set up on either side of the lone street running through town. Also, there is a barbecue stall that sells delicious llama anticuchos (skewered meats) and empanadas. 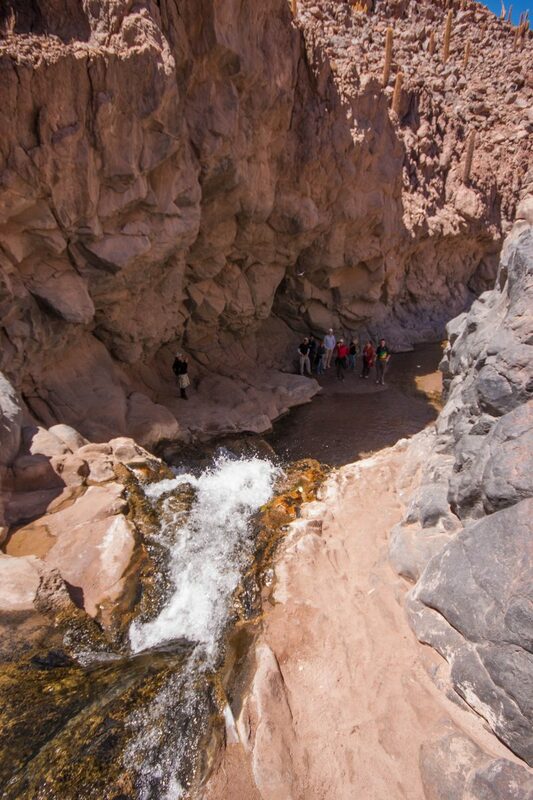 The last stop on our tour was a hike through Cactus Valley (Los Cardones Ravine) to view a waterfall. Unfortunately, at this point in our tour, Christina’s body had decided it was time to nap. So, she opted to doze off in the van while Kevin joined the hike through the Los Cardones Ravine. From the serene monotones of the desert landscape jumped a flash of color from bushes and flowers, all the way to the start of the cactus valley. The shift in vegetation is due to the area being fed by two merging rivers. 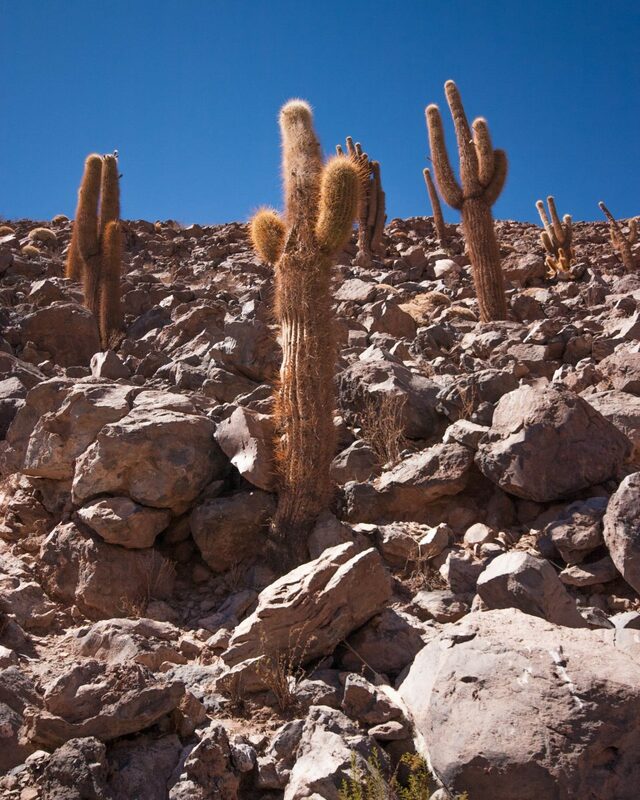 Tall rocky hills frame the gorge and are dotted with the most perfectly shaped cactuses. The cactus here grows at a rate of 1 cm/year. With some cactuses measuring over 30 feet in height, I was looking at some pretty old cactuses! Visions of watching the roadrunner out-smarting Wile E. Coyote flashed through my mind as I made my way along the small riverbed. The cactus valley presented a wonderful splash of life in a region that otherwise offered little more than low lying bushes. Pro-Tip: As you make your way down the river there are a few parts where you may need to jump from rock to rock. The river is not wide during the dry season, but it takes some sturdy footing to avoid slipping into the ankle-deep waters. The gorge began to narrow and the cliff walls became steeper. Next, the unmistakable sounds of a waterfall began to permeate the air. The small river dropped suddenly away into a deeper canyon. We took turns climbing down to the pool at the bottom. The spray from the water was refreshing against the increasing heat and dryness of the desert air. As we climbed back up towards the van to head back to San Pedro de Atacama, I chose to hang back for a few minutes. I took off my shoes and splashed alone in the desert creek! It’s not often you get a desert waterfall to yourself. 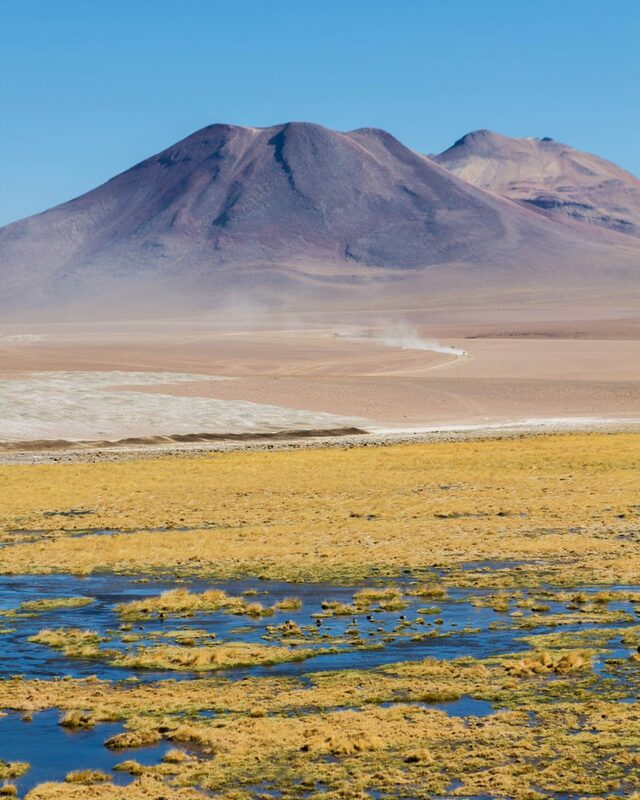 San Pedro de Atacama is a truly surreal place. It was one of my favorite places I have visited in South America with a surprising culinary expertise existing in the little town. Only in the Amazon have I seen stars in the night sky comparable with the crystal clear skies of the high altitude desert. Enjoyed the article and all this South American travel is reminding me of my year long trip through the continent. Beautiful. I completely agree, and San Pedro de Atacama really did have some incredible food considering it’s remoteness. I really wish I had more experience with my photography when we went so I could have captured that incredible night sky. Great read and lovely pictures! I’m still gutted I had to miss that trip, because I was ill. Luckily for you, you were able to make it! Your photos are AMAZING! I’ve not yet been to Chile, but this is just one more reason to go. I am particularly fascinated by the Cactus Valley, The Cactii, stall tall amidst the barren land, a proof of their resilience and survival in the toughest conditions. San Pedro is a wonderful town given its remoteness. We opted not to do the Tatio Geysers (we had flights to Isla de Pascua to catch), and having just visited termales in Bolivia didn’t feel we’d miss it as much as other activites (such as Valle de la Luna). 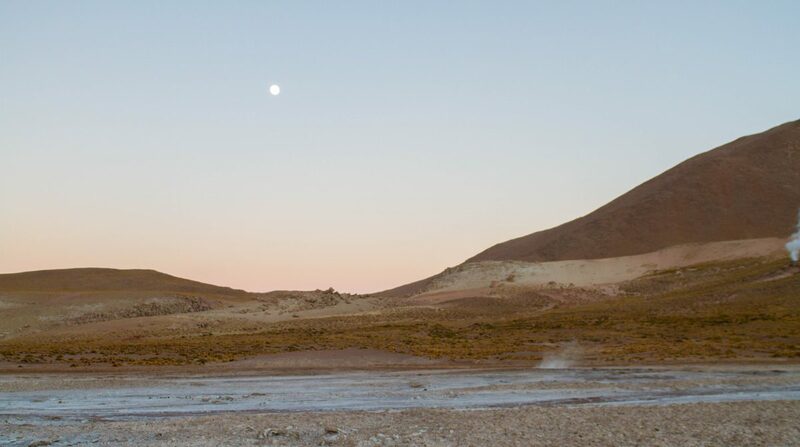 We didn’t have any issues with the altitude, although we purposefully waited until our last day in the high altitudes of the Atacama before going to El Tatio so Christina would have the maximum opportunity to adjust. We’ve hiked at similar altitudes in Hawaii with little more than about an hours acclimation and had no problems, but altitude can affect everyone differently. Make sure to bring plenty of water, make sure you have eaten, and only go at the pace that your body allows. What a cool place, especially so remote. It’s very different from the geysers and thermal areas we’ve visited. We have never been to any thermal areas but the photos look awesome! 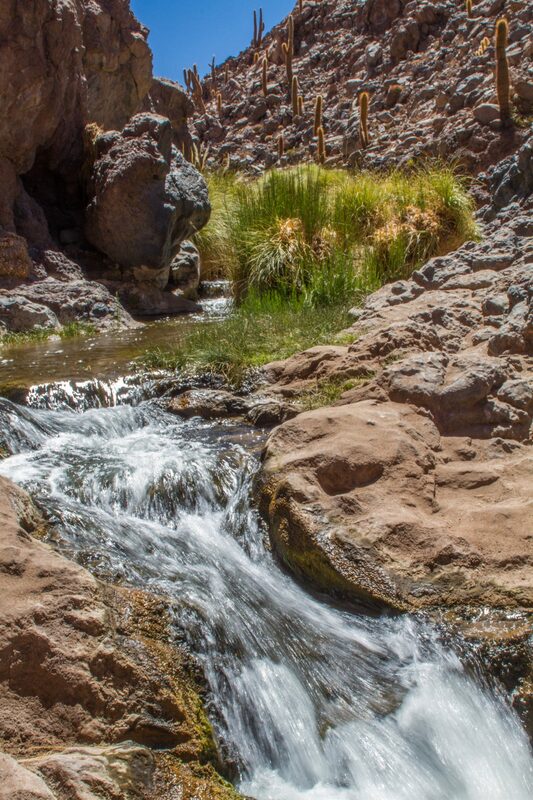 Would love to explore the various trails and take a dip in the desert creek. This terrain looks fascinating and not how I pictured Chile. Hopefully you’ll get back again when you can enjoy the hot spring. Some great photos here guys, and how amazing that you travelled here while pregnant. We’re planning a trip to south america late next year, so will definitely save this for then. Oh my GOD – the pictures are mind blowing! I’d love to sit and chill in that steam bath after hiking. I love natural pools! The landscape is amazing. Yes, it’s such a diverse country. I only saw between the Los Lagos & Capital regions. What you saw looks like fun! Really fantastic photos! The colours are so striking! 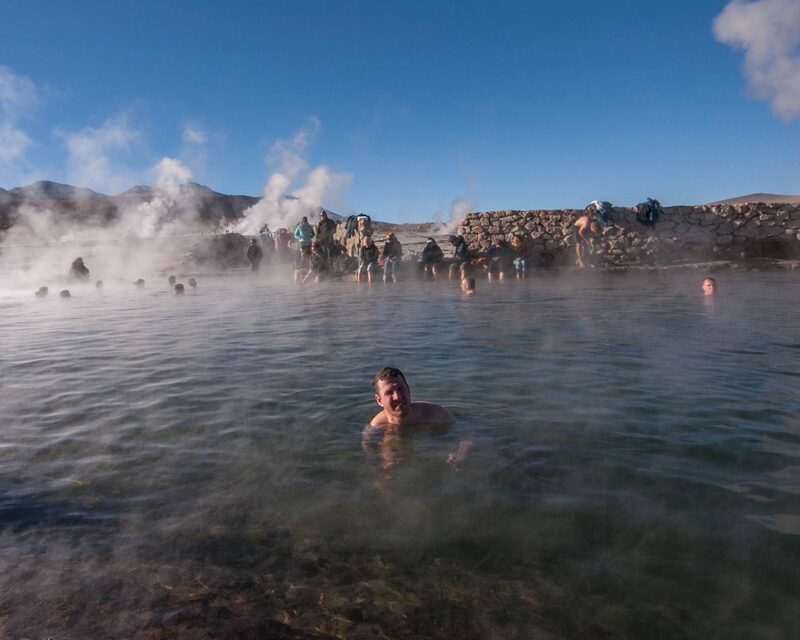 I had chronic altitude sickeness when I was there – all I remember was lying on the rocks by the side of the geysir and thinking that I might die there! Thankfully, it passed before too long and I got to enjoy the spectacular scenery around that region. Wonderful post! Oh that’s terrible! We’re lucky enough to have not been hit with altitude sickness yet. I hear it’s terrible. I’m so glad to hear you were able to bounce back and enjoy this amazing place! That’s definitely something to be aware of Katy. We went before we had kids and El Tatio had no safeguards at all, which is awesome for an adult, but could offer terrible consequences for a little one. I’m going to add that to our article. I’ve only been to the Southern tip of Chile and even from there, I could tell that the country is incredibly diverse. I guess it goes with covering so many latitudes. I’d love to return to visit the northern part of the country. Your photos are phenomenal and I’m glad you can take a tour from San Pedro, since I’m usually not too keen on driving abroad. I have heard about this and am so tempted to visit. But the one thing that I am worried about is getting sick from the altitude. I had a friend that got pretty sick from it, so I am worried the same will happen to me. The photos are stunning! That looks fabulous – I have been to geysers in other parts of the world, but didn’t even hear of this when I was in San Pedro. I need to go back and see the rest of Chile, so thanks for the tip! What an amazing read. Altitude is a fear factor for me, I’ve watched so many docs about Chile and even the most unlikely of people suffer with it. I’d still love to go though. Altitude affects everyone differently, the only real way to know is to climb 🙂 Just take your time and follow your guide. What a beautiful place. I still haven’ been to S America, but adding this place and the hot springs to my bucket list. Thank you for inspiring me! That looks like an amazing experience. I am not an early morning person but I think I would make an exception to see those geysers. They look like a magnificent lunar landscape! I hope to get to Chile soon! The thermal pools look and sound amazing after all of that hiking! I cannot wait to explore Chile for myself. You guys always have amazing stories to tell and so inspirational too. Pregnant and hiking? With more kids trailing along? I sure could not do such a thing…hence why I don’t have kids yet and don’t know if I ever want any for that reason. Good on you though, very inspiring. It’s easier than it sounds Shayan 🙂 Kids are a personal choice, but traveling with them just makes the experience more special! It’s such a bummer you couldn’t go into the hot springs. I would have been so sad! Your photography makes me feel like I’m actually visiting the place with you! Firstly, it is very impressive that you are traveling while pregnant. It must be very challenging. Well done! Although I haven’t been to Chile yet, I am surprised to read about how diverse the country’s landscape is. It is interesting about the lack of safety precautions around the geysers – while traveling in Central America we were surprised about certain spots that were precarious and were not fenced off or anything at all. It makes you really pay attention to where you are going. Your photos are always a joy to see. Those hot springs look incredible, and I had no idea geysers were so beautifully coloured! This is so awesome! I’d love to experience this. Such beautiful photos hehe. Wow, this place looks awesome! We are headed down that way after the new year, I would love to fit this in our itinerary! We would have to do the tour it seems like though as we won’t have an all terrain or 4 wheel drive vehicle, but that’s no problem! Thanks for sharing! Wow doesn’t it look amazing and certainly worth the hike! I didn’t know about this place, looks incredible. Awesome pictures, congrats! I’ve got “visiting a geyser” on my bucket list! It’s really cool that you were able to make a day out of it – definitely another plus to going with a tour. Also, your tips are awesome – altitude and assuming a place has safety measures is something we rarely think about when planning and booking excursions. What an experience! The geyser looks amazing. And good on you for travelling in your second trimester. Wow! I had no idea such a place exists. Love the pictures and practical tips. This place looks INCREDIBLE! It reminds me of Iceland but seems a lot more accessible with way more geysers for viewing. That outdoor hot swimming pool looks awesome. Your photos are gorgeous, and it’s too bad you weren’t able to enjoy those hot springs. I give you a lot of credit for doing this trip while pregnant! I’ve only been to Santiago and Valparaiso myself, it was the end of two months’ trip and I had no time for Chile – a pity, I know. I hope to return one day as the landscapes of South America are truly amazing. It looks incredible, I love New Zealand and Japans geothermal areas so I’d love to see it. You did really well handling the trip and the altitude while pregnant. We are currently out in Bali and I am too scared to hike Mt Rinjani – while you are pregnant and hiking in Chile *inspired* This looks really cool – it will be a while before we make it out to that side of the world but definitely want to explore Chile in the future. Brigid, I think it is so natural to be scared. I checked everything out with my doctor beforehand and had a lot of back and forth with the tour companies. But once I was actually on the tour, I only ever participated in what I was comfortable doing which varied by day. I think you are right in listening to your gut. Hopefully, you get to hike Mt Rinjani once you have had your little one. Bali is very high on our bucket list and we hope to visit someday soon. I love this! Your photos are gorgeous, and really capture the beauty of this otherworldly landscape! The geysers look stunning, especially with all that early morning steam, and a geyser hot springs!? I’ve never heard of such a thing, but am dying to visit one now! I traveled to Chile 7 years ago and I’ve found the region around San Pedro de Atacama to be one of the most picturesque places when it comes to surreal landscapes. Just amazing, sometimes I felt like I was on a different planet. You captured this place perfectly with your stunning photos. Brought back some good memories 😉 Well done. Thanks so much Sab! We totally agree. It’s a really special place! Great photos. It looks like an amazing place to visit. I have yet to make to that part of the world but hopefully will. So much to see and experience. I don’t like the little villages that thrive off of tourists though. I know it is important for their economy but to me there is not much authenticity, it is more manufactured for tourists. I prefer to visit the places that most tourists don’t that way I can really experience the culture, people and place. This is not that kind of village Bob. The locals still live an active farming life, but with the crowds coming through they have found a way to offer a service in an area where food and drinks would otherwise not be available. What a cool place. It looks like you’ve landed on another planet. Each photo is just incredible. As I scroll down, I keep on wondering if this is still part of Earth. haha. I could imagine how you did enjoy the place. Wow so beautiful! It kinda reminds me a bit of Yellowstone. They also have some steam baths there I think but I’ve never tried it. Great photos! Hopefully I get to see this for myself someday. Chile seems like a wonderful place to visit. The geysers indeed looks heavenly (and to dive in, too) but I’m concerned with the 35 degrees C temperature. Oh well, hope to see the place someday. Wow this place looks incredible! I love the photos you took. They are all so vivid and dreamy! I guess I shouldn’t be surprised they have geysers in Chile even though they have volcanoes. I would love to explore and see the eruptions and just explore the local culture. I’ll start by stating how beautiful photos you got. Second, the glacier looks nice! You two had a rough, but an exciting journey and I’m sorry that Christina didn’t have the chance to dip in that inviting and steaming bath. However, it is always better to put health first! I am winding up my visit to Uruguay and will be in Argentina in a couple of day and will get to Chile from there. I have no words to express how helpful this post is. The town of Machuca seems like a must visit place for its distinct beauty. Wow! What an incredible experience. You photos are gorgeous and I really liked all the insider tips. The hot springs sounded like a perfect break and I was so sorry to read you couldn’t go in – but safety first. Thanks for sharing about such a cool region. Oh wow! When I saw the photo of people taking a bath at the hot spring. I was so amazed! I never had a chance of doing things like that and im lioking forward to visit that palce in Chile someday! This landscape is unbelievable! And your photos are gorgeous. I can’t wait to get to Chile next year. Happy travels! The steaming geysers are quite stunning. I must say, quite a different experience. It was amazing! I highly recommend making a visit! This sounds like such a cool experience, I would definitely love to try the steam baths. Its really awesome that you’re traveling while pregnant, I’ve met a few mom-to-be’s who’ve warned me against doing the same. Glad to read from your perspective. Wow. This is so Amazing! I’d love to experience this.